Ninh Thuan (VNA) - The Association for Sponsorship of Poor Patients of Ninh Thuan Province has supported 401 children with congenital heart diseases over the past nine years. The figure was released by president of the association Hoang Thi Ut Lan at a conference to review the surgery programme for local children with congenital heart diseases from 2008 – 2017 on August 1. The operations, 393 conducted domestically and eight in the Republic of Korea, cost a total 29.5 billion VND (1.3 million USD). Addressing the event, Vice Chairman of the provincial People’s Committee Le Van Binh called on organisations, units and individuals from the province and other localities to aid poor and needy patients, particularly children with congenital heart diseases. 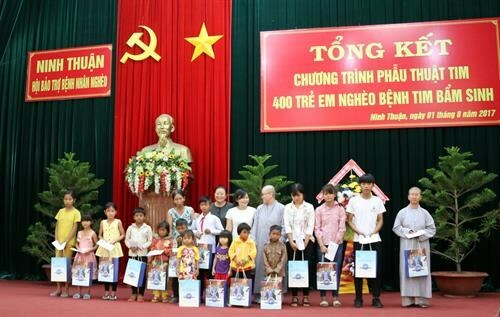 On the occasion, more than 1.3 billion VND (57,200 USD) was raised to help more needy child patients. Nine units and six individuals were honoured during the event for their contributions to the charity work.